Head vs. Heart, Good Friday vs. Easter Sunday? Now that the 2011 Academy Award nominations have been announced, the speculation and predicting games have begun in earnest. 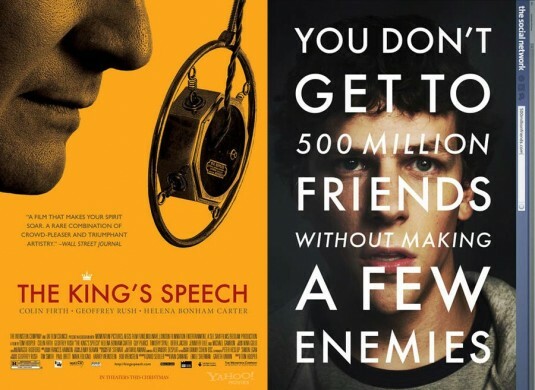 Every expert has pegged their favorite movie, actor, or crew member to take home a gold statue later this February - but two films have risen to the top of the pile as the Oscar frontrunners: The Social Network and The King's Speech. Many critics have said this race is a battle "between the head and the heart." They say that Social Network makes people think about their digital, interconnected reality, while King's Speech is simply a good old-fashioned tale of triumph over struggle and adversity. Throughout Oscar history, the battle "between the head and the heart" has raged. Just last year, while countless people loved Avatar, the Academy bestowed its highest honors to a movie that made people think hard about the war in the Middle East: The Hurt Locker. And it seems that the timeless struggle will continue again this year. But perhaps there is another way to look at this tug-of-war from a faith perspective. In the Christian context, this all translates to a tension between Good Friday and Easter Sunday. Movies such as Social Network, Hurt Locker, The Departed, Inception, Black Swan, Citizen Kane, and in a very literal sense, Jesus Christ Superstar, all end on a note of uncertainty (sometimes even death). In these films, the credits roll before a satisfying resolution has been reached. They close their story on a "Good Friday" moment, allowing the moviegoer to draw their own conclusions or simply leave them uneasily hanging on a precipice. On the other hand, movies like King's Speech, Avatar, Slumdog Millionare, Toy Story 3, Forrest Gump, Star Wars, and The Return of the King have what skeptics call "a typical Hollywood ending." These films close on a triumphant note, not unlike the experience of Easter Sunday. They provide hope, joy, and closure to the viewer, confident that good has overcome evil, success has beaten struggle, and happiness has replaced hardship. It is fascinating that people consider Good Friday films to be movies of the head, while Easter Sunday films are seen as movies of the heart. What does this say about us? Perhaps we are caught up in the struggle, stress, and uncertainty of life that overwhelms us. Our minds, then, are constantly focused on the painful reality of the moment. Films like The Social Network remind us that no road in life is ever easy, even the journey towards becoming the world's youngest billionaire. The cross is always before us. This condition prevents us from taking time to rest in hope, never being able to take a moment to celebrate both the big and small wonders of life. Movies like The King's Speech seem like fantasy, but yet when we see them, it tugs on our heartstrings - teasing us with the possibility of victory over our worst days and our most anxiety-ridden struggles. Our faith teaches us that, in this life, we will experience both - but that we cannot ignore one for the sake of the other. We are people of the cross and the resurrection. The Oscar frontrunners are reminders of this tension. Like the characters in The Social Network, we do encounter uncertainty, struggle, and betrayal in our lives; but like the characters of The King's Speech, we also have good days, great friendships, and memorable triumphs over frustrations and evils that come our way. But while we navigate between these two extremes, Christ reminds us that, on the last day, hope and goodness will always win out over negativity, struggle, and uncertainty. That is not to say that all movies with "Easter Sunday" moments should take home every Oscar... but it does tell us what awaits us in this life and the next. We should, however, be grateful for the Academy Award race each year - to remind us of the "paschal mystery" that we experience throughout our lives. So on Oscar night, and every night for that matter, may we face our "Good Fridays" with confidence, strength, and courage, and celebrate our "Easter Sunday" moments with boundless joy, gratitude, and prayerfulness.